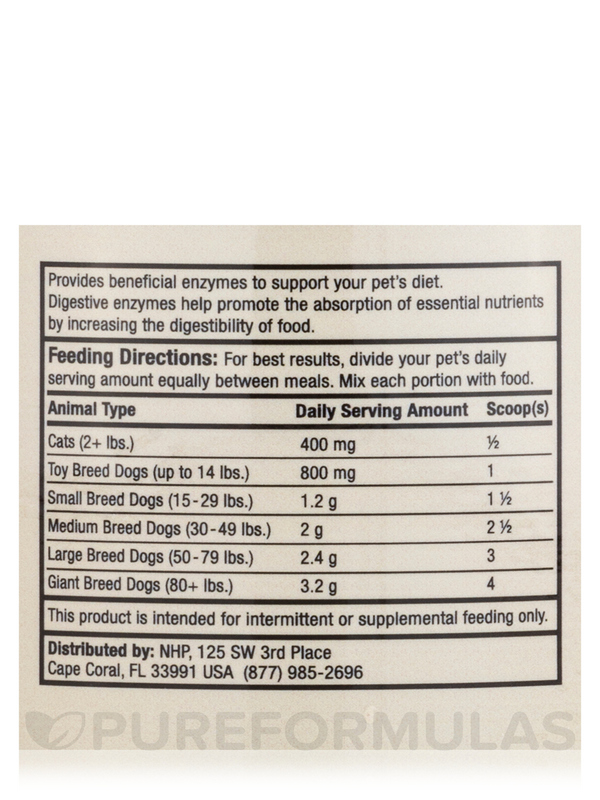 Provides beneficial enzymes to support your pet's diet. 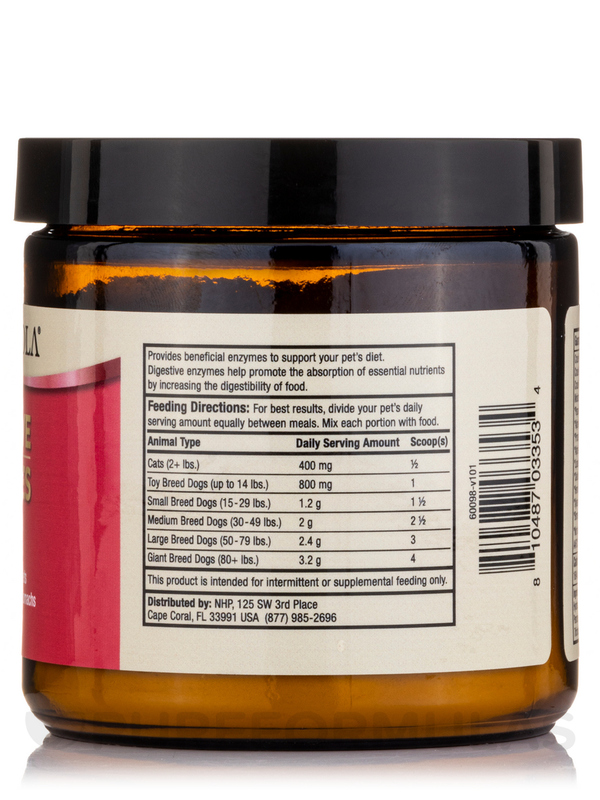 Digestive enzymes help promote the absorption of essential nutrients by increasing the digestibility of food. Calorie Content (Calculated): 1630 kcal ME/kg or 1.6 kcal ME/1g Scoop. 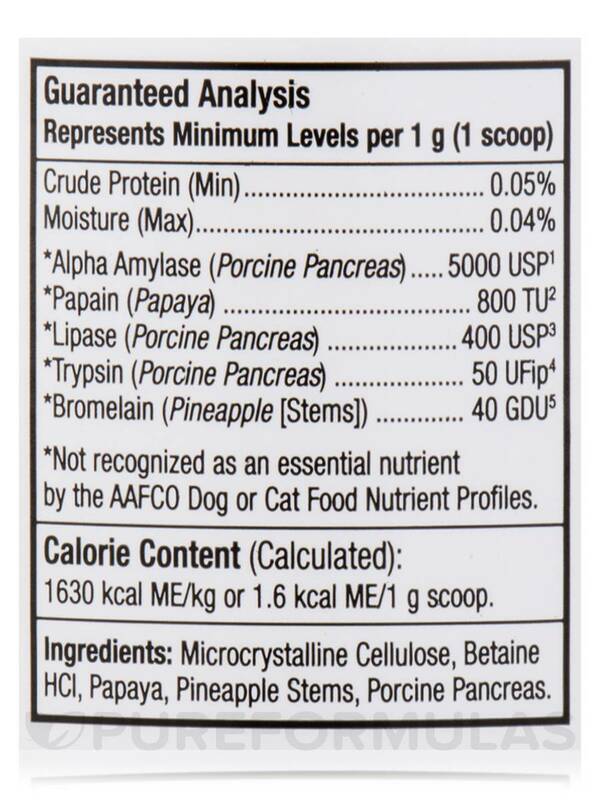 Ingredients: Microcrystalline cellulose‚ betaine HCI‚ papaya‚ pineapple stems‚ porcine‚ pancreas. 1Contains a source of alpha amylase which can hydrolyze starch. 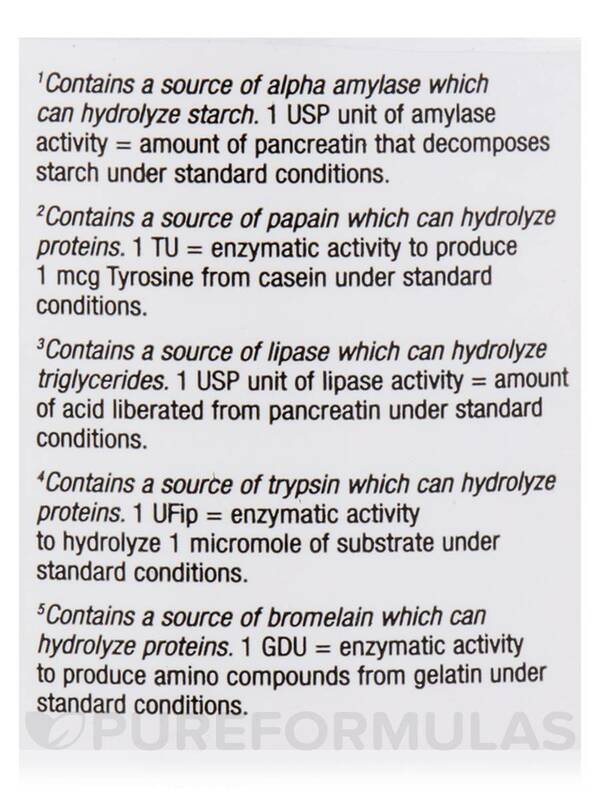 1 USP unit of amylase activity = amount of pancreatin that decomposes starch under standard conditions. 2Contains a source of papain which can hydrolyze proteins. 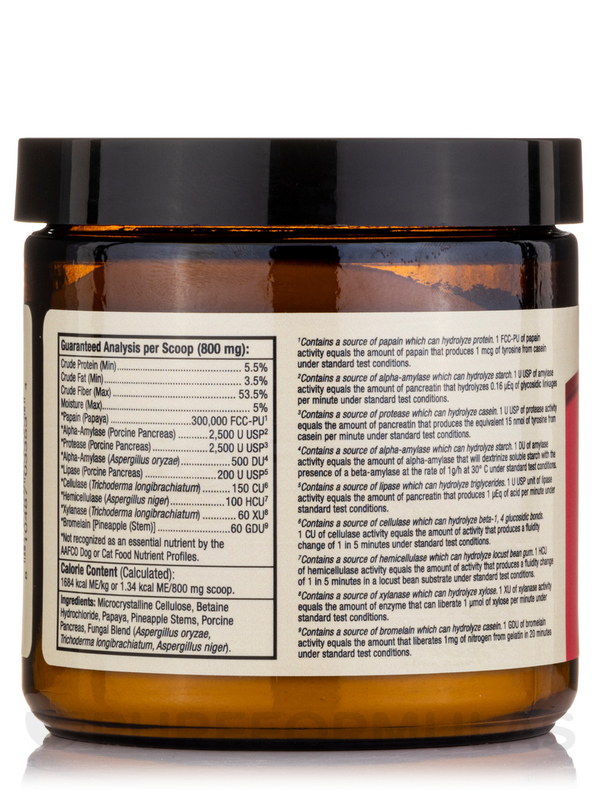 1 TU = enzymatic activity to produce 1 mcg Tyrosine from casein under standard conditions. 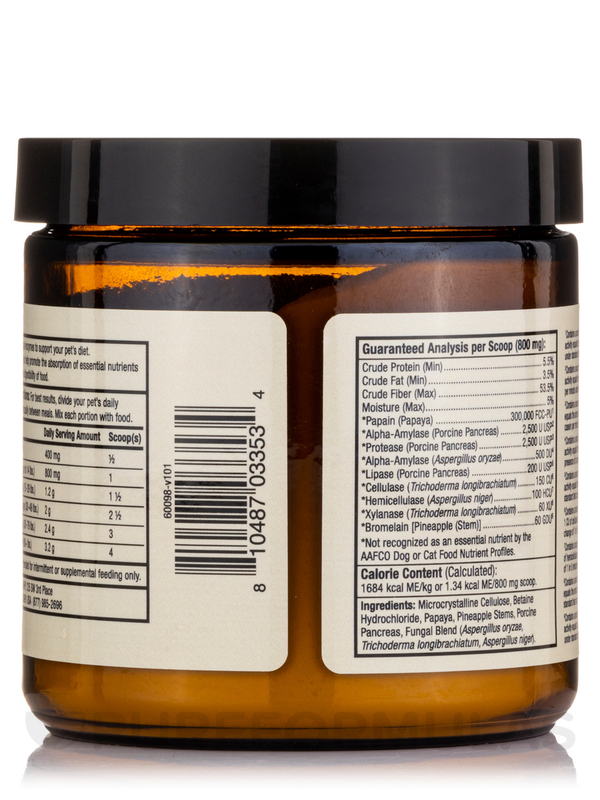 3Contains a source of lipase which can hydrolyze triglycerides. 1 USP unit of lipase activity = amount of acid liberated from pancreatin under standard conditions. 4Contains a source of trypsin which can hydrolyze proteins. 1 UFip = enzymatic activity to hydrolyze 1 micromole of substrate under standard conditions. 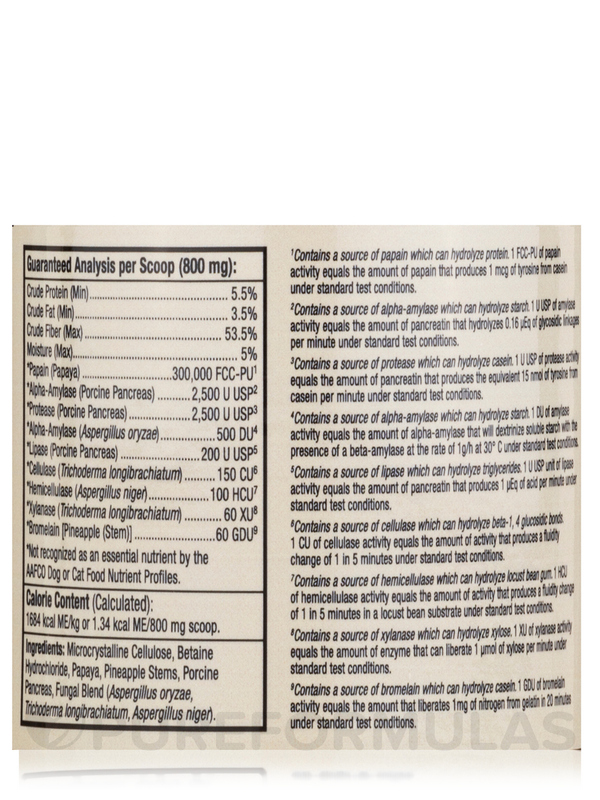 5Contains a source of bromelain which can hydrolyze proteins. 1 GDU = enzymatic activity to produce amino compounds from gelatin under standard conditions. For best results‚ divide your pet's daily serving amount equally between meals. Mix each portion with food. Cats / Half Gram / Half Scoop. Toy Breed Dogs (Up to 14 lbs.) / Half Gram / Half Scoop. Small Breed Dogs (15-29 lbs.) / 1 1/2 Grams / 1 1/2 Scoops. Medium Breed Dogs (30-49 lbs.) / 2 1/2 Grams / 2 1/2 Scoops. Large Breed Dogs (50-79 lbs.) / 3 Grams / 3 Scoops. Giant Breed Dogs (80+ lbs.) / 4 Grams / 4 Scoops. My Maltese was having intermittent problems with vomiting bile and mucus in her stool. 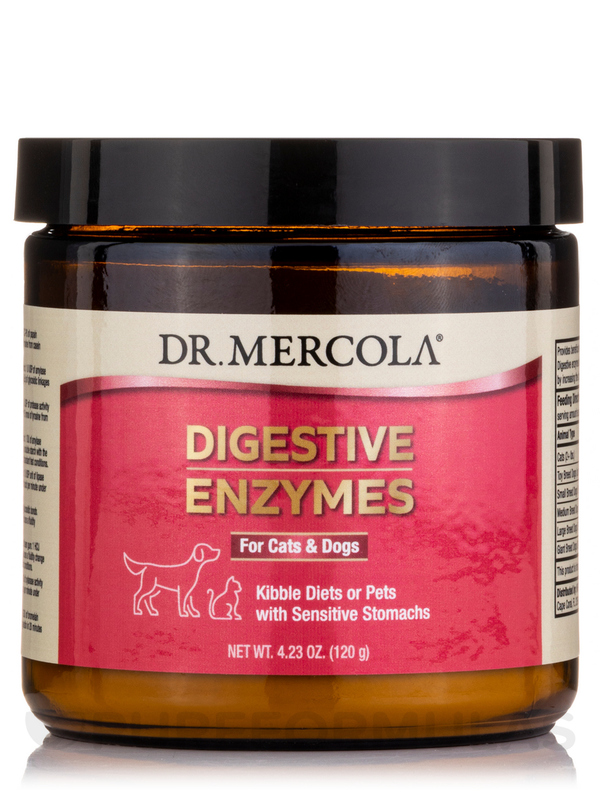 This Digestive Enzymes for Cats & Dogs by Dr. Mercola has helped her tremendously! Lasts a very long time. I purchased Digestive Enzymes for Cats & Dogs by Dr. Mercola to mix into my cat's food because he was getting sick every time he ate anything! This is the second digestive enzymes product I purchased because the first one was unsuccessful. I respect Dr. Mercola and that is the reason I purchased it as well as the enzymes it contains. Kitty is keeping his food down now. Thank you for this product! The small scoop is awkward to use.